What started as a local story in a local newspaper about an unusual white turkey legally harvested by a Mississippi hunter turned into national news and a microcosm of the cultural divide in America when ESPN’s Keith Olbermann attacked the hunter on Twitter. This is wrong on so many levels, yet so illustrative of how the left views sportsmen & women and others who do not comply with their particular moral proclivities. 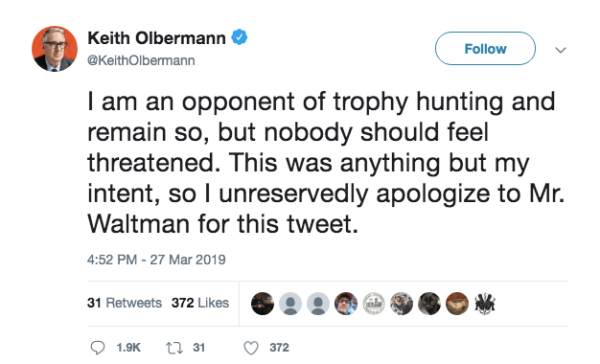 Olbermann begins with a personal attack on the intelligence and morality of Hunter Waltman, the Mississippi turkey hunter whom he had never met nor had prior knowledge of. What can be inferred from an opening salvo of personal attack is that Olbermann and most progressive elites look upon hunters with disdain and paint us, especially those of us from the south, with the same broad, arrogant strokes; that hunters speak primarily in a mix of grunts and bad grammar and are endowed with small brains; that hunters are dumb, slow witted, stupid people because if it were not true, we would not be hunters, right? Or so goes the rationale in the echo chamber in Bristol, Connecticut. More nuanced, but just as discriminatingly elitist is Olbermann’s “scumbag” chide, denoting a general lack of morals for those of us who would sully our hands with killing animals in the first place; all the more so if the animal is unique or exceptional, such as a white turkey, a pie-bald deer...or a 400-inch elk. This illustrates the very heart of the liberal’s strategy in their campaign to eliminate hunting. On it’s face, killing a “rare” or “threatened” animal is an emotional abomination to most. But to make a proper decision on the issue of hunting unique species, more information is required. Information about wildlife conservation in a 7.5B person world, herd and habitat management, sustainable off-take numbers, financial, and indigenous peoples enhancement; all of this evidence is needed to make a learned judgment on the question of hunting in the court of public opinion. But this critical information is never communicated by the Olbermann’s of the world. Hide all of the facts and science and benefits of hunting while tugging on the heartstrings of the masses with emotional drivel. This is the strategy of the anti hunting lobby. It is also great strategy as a business model and is how the Humane Society of the United States cajoles $19 each month from thousands of unwitting donors with photos of neglected dogs and cats they will never shelter. But I digress. Fortunatley, there is still a sense of fairness left in the Twitter-verse, if not in Twitter itself. It was not an administrative admonishment that ultimately created Olbermann’s mea culpa, but the public outcry against his reckless, thuggish behaviour and abuse of position that finally wrested an appology from the ESPN broadcaster, but more on that later. And the nitwit clown who wrote this fawning piece should be fired. Here any pretense of journalistic integrity and 1st Amendment liberties are crushed under the weight of the Olbermann’s hubris. 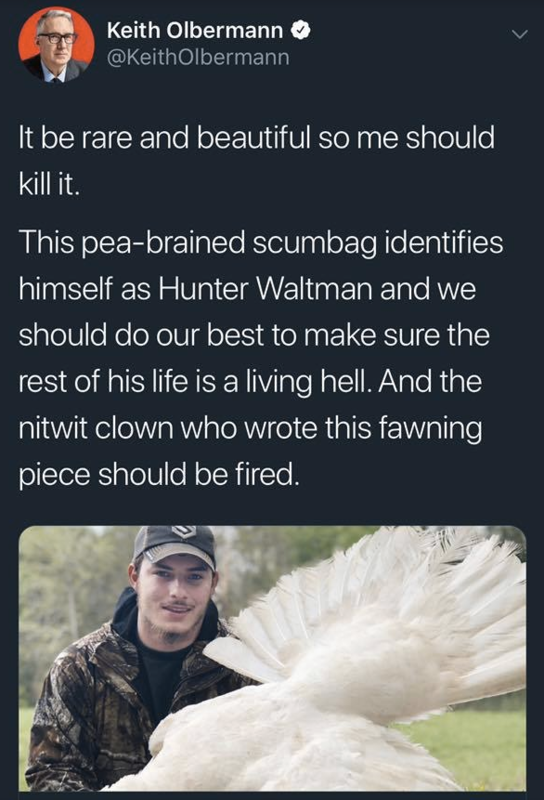 Not only does Olbermann belittle and castigate the turkey hunter-subject of his tweet, he does the same to Brian Broom, the “nitwit clown”/journalist who wrote the story for the Mississippi Clarion Ledger. He also said Broom “should be fired” for having the temerity to write a story about Waltman’s hunt. One would think an ivy league graduate who has spent his entire career in journalism might have more than a casual awareness of the journalistic freedoms provided in our Constitution. But in Olbermann’s world, the Founders could never have intended speech or press freedoms to those of us he deems politically incorrect, ergo Broom, his column, and his job have got to go. Olbermann is nothing if not smart. While this sounds like an apology, it is really nothing more than window dressing to call off the social media mob that he wished to incite against Waltman while at the same time, reiterating his position. Few consider turkey hunting trophy hunting, but it is unlikely one with such an urban-laden existence as Olbermann could be expected to know the difference. This is simply a reiteration of the fact he is against hunting, does not like hunters, and remains unapologetically so even in his forced apology. Yet it was positively Olbermann’s intent. No one, certainly not a celebrated liberal political commentator with nearly 40 years experience in mass media, would think naming a private individual and telling 1.08m Twitter followers to “…do our best to make sure the rest of his life is a living hell” is anything but a threat. At best, it is a reckless act. At worst, such exhortations from one with such influence as Olbermann’s would be considered criminally culpable. If any harm should come to Mr. Waltman as a result of Olbermann’s actions, I expect the District Attorney in Hancock County Mississippi would view it the same way. Hopefully for Mr. Waltman’s sake, that decision will never have to be made. Most people believe what Keith Olbermann did was wrong, yet others, albeit a minority, think attacking a hunter was the right thing to do. This is disturbing. Twenty-five years ago this would not have been the case. Moral outrage over a celebrated broadcaster picking on a previously anonymous private citizen would have been nearly universal and resulted in Olbermann’s immediate dismissal from ESPN. But in 2019, bullies from both sides of the aisle call out and wish evil upon even the least of us who happen to offend. This is bad news for hunters. As the percentage of hunters in the world continue it’s long decline, we become more and more isolated from the protections of society; protections such as fairness, morality, and the rule of law. While it is inevitable hunters will be left to our own devices to advocate the necessity of our sport, one of those devices we can use to our benefit is social media. The same social platforms the Ricky Gervais’, Ellen DeGeneres’, and Keith Olbermann’s of the world use to attack hunting can also be used to defend it. Planned, coordinated social media campaigns to communicate facts and science can do much to inform the undecided about the good that hunting does. The odds will always be against us, but as the NRA has proven, one million grass-roots advocates are more powerful than a zeolot with one million followers. Keith Olbermann running afoul of a turkey is proof.